Saint Llawddog , or Lleuddad , ( fl. 600? ), is said to have been the son of Dingad ab Nudd Hael , king of Bryn Buga (i.e. Usk ), and Tefrian or Tonwy , daughter of Lleuddyn Lwyddog . Few details are known about his life, but tradition maintains that he worked many miracles. He appears to have forsaken his father’s kingdom in order to live the life of a religious recluse with his brother BAGLAN in Caernarvonshire . His later years are linked with the isle of Bardsey . 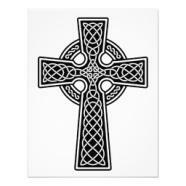 He was chosen abbot of the island’s religious community, and is said to have ended his days there. A Welsh ‘ Life of S. Llawddog ’ is preserved in National Library of Wales (late 16th cent.). The churches of Cenarth, Penboyr, Llanllawddog in Carmarthenshire and Cilgerran in Pembrokeshire were all originally dedicated to Llawddog. His memory is also perpetuated in the local topography of the places so named, in the form Lleuddad, in parts of the Llŷn peninsula . His feast-day is variously given as 15 Jan., 21 Jan. or 10 Aug. The local parish Church is dedicated to Saint Llawddog. Although the present building is relatively modern, it is on an important ancient site, and was the “bishop house” of the Cantref of Emlyn. 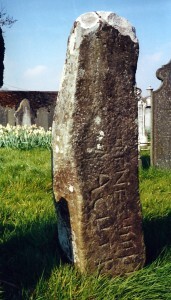 Within the Churchyard is a stone with Ogam Scrip, still visible and a stone’s thow away on the south side of the river is the Holy Well of St Llawddog. The relics of Saint Luke the Surgeon; a great saint of the 21st Century, unmercenary healer and miracle worker will be brought to the church of St Luke, Birmingham this Saturday. 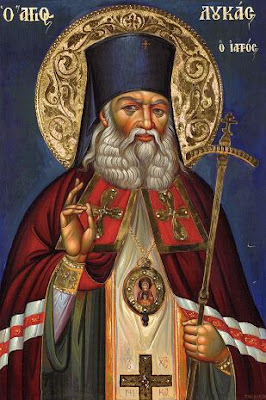 The relics of Saint Seraphim of Sarov and Saint Heraklidios of Cyprus will also be brought with those of St Luke. welcoming of the relics of St. Luke of Simferopol and Crimea, accompanied by the Metropolitan Isaiah of Tamassos and Orinis and straight after Vespers. “S. Lhud, that is anger; she is commonly called S. Alud or Aled, but Giraldus Cambrensis calls her Almedha … It seems that having from her infancy dedicated herself solely to the service of God, in her riper years, being violently pressed by a young prince to marriage, to free herself from his solicitations and those of her family, she secretly stole away from her father’s house in a disguise, resolving for a time to conceal herself in the neighbouring villages … The first she retired to was the village of Llandew, where she was so ill treated that, fleeing from hence she retired to a village called Llanfilo, three miles further, to live in greater obscurity, which, joined with her poverty, beauty in rags, was the cause she was treated as a common thief. From thence, fleeing back again to another village called Llechfaen, within a mile of Brecknock, where she was treated with such scorn and contempt that nobody would receive her, but forced her to lie in the street and the high road, which ever since is called of her name in Welsh, Heol S. Alud. After which she resolved to retire to some solitude, never more to converse with mortals; and such a solitude she found upon a hill called the Slwch … near the town of Brecknock, which was then overgrown with wood. Here, that she might receive no further insults, she desired the Lord of the Manor to give her leave to dwell, which was very courteously granted, with a promise of other charity, upon which she there built her a little cell or oratory and was used often to go down to the Castle of the Slwch to beg for bread, where she was very hospitably received. “When her thoughts were settled in a little tranquility after all these storms, by way of prophecy she said: That by the secret judgment of God a chastisement would rest on the village of Llandew for the injuries done to her; that the village of Llanfilo would be plagued with thieves, as they are to this day above all others, and the village of Llechfaen with envy, as indeed they are almost continually in contention and law with one another. The ‘Slwch tump’ – an iron age fort where we think Eluned had her cell. A tree (not a yew tree!) in the field where we think the well and the church were situated.